I decided to make this cake again because it is quick, easy and a lot of fun. It also looks beautiful as a centrepiece on a festive table. 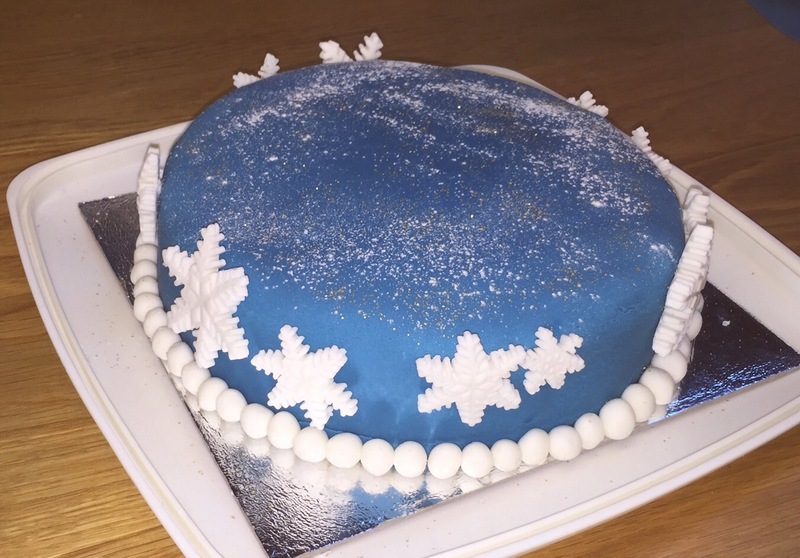 To create the cake, I covered a vanilla sponge in blue sugarpaste and then cut snowflakes out of white sugarpaste, which I attached around the edges with water. You can buy edible glue to attach more fiddely pieces, but I have always used water for my cakes because it is easily accessible, much cheaper and does the job. Following this, I rolled out some white fondant balls and attached them around the base of the cake to conceal any rough edges. Finally, I sprinkled over some edible gold glitter and icing sugar to create the snowy glistening effect.